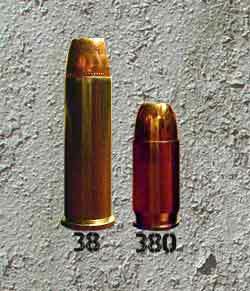 The main difference between the 380 and .38 special is that the .38 special has a larger cartridge. The bullet diameter on the other hand is virtually the same. The carrying capacity is another issue. The 38 special is usually loaded in a 6 round revolver and if you are talking snub noses then it will usually hold just 5. The 380's hold on average between 6 and 12 rounds with some guns like the Bersa Thunder Plus 380 holding up to 15 rds. The 38 Special dates back to 1897 and is a modification on the .38 long colt round used by the miliatary for their pistols. The .380 Automatic Colt Pistol was developed by John Browning (some people call it a 9mm Browning) and was marketed by Colt as a self defense round in 1908. Which is the better cartridge? This is debatable and you must first define better. Better for concealment? Better for self defense? Better stopping power? Better penetration and expansion? The .380 ACP is better for concealment. Notice we did not say conceal carry as that would insinuate that we would actually be using the round to stop a "bad guy". We just said concealment, and as the .380 acp is shorter it can then fit into a smaller guns frame. The smaller the gun the easier it is to conceal. Most people argue that the .380 acp is under powered. With that in mind we have to lean towards the 38 special, but the .380 acp tends to hold more rounds so this complicates things. Again the 38 special cartridge packs a larger punch because it contains more powder. The 38 special will have better penetration using the same bullet tip (hollow point vs hollow point, fmj vs fmj etc) because of the larger cartridge powder capacity. The conclusion is of course that there is no conclusion of course. People have been arguing this topic for a long time, what we've merely done is to lay out the unbiased facts. Think about what we've said and see how this may best pertains to your situation so that you can yourself make and informed decision. Good luck.